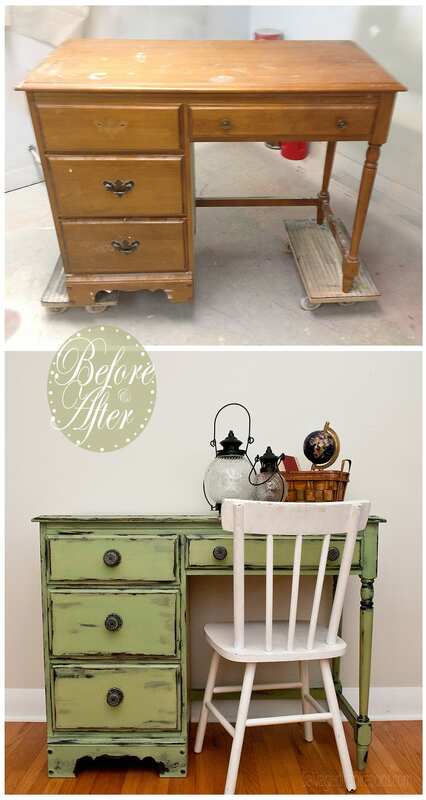 Sign up to get your dose of Inspiration and DIY Furniture Painting Tips! How to Distress Furniture with Vaseline… What Took me So Long? Hi there and welcome back – I can’t believe the holidays are behind us and 2015 is here! Don’t you just L-oooo-V-e the ‘feel’ of a new year with all the possibilities that lie ahead! 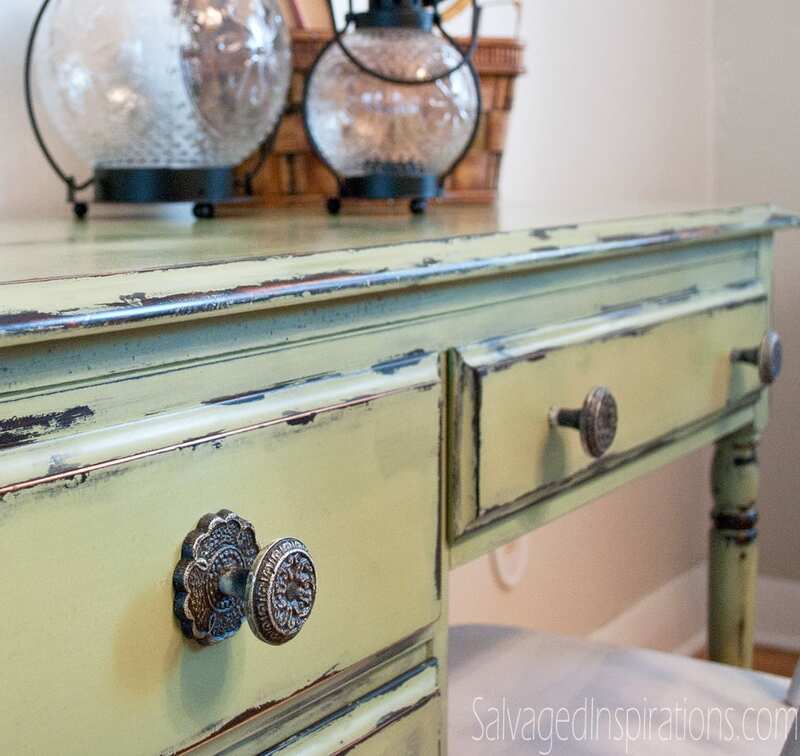 What I envisioned for this outdated desk was a pop of color and a heavy distressed finish. To reduce sanding time and speed up the distressing process, I used Vaseline to distress the entire piece. And before I reveal a few tips I learned and show you how EASY it is to distress with this Vaseline technique, here’s the before and after and a few close ups. CHARMING! Until now, I’ve been most comfortable distressing furniture by hand. the good ‘ol fashion way, with elbow grease and sandpaper. 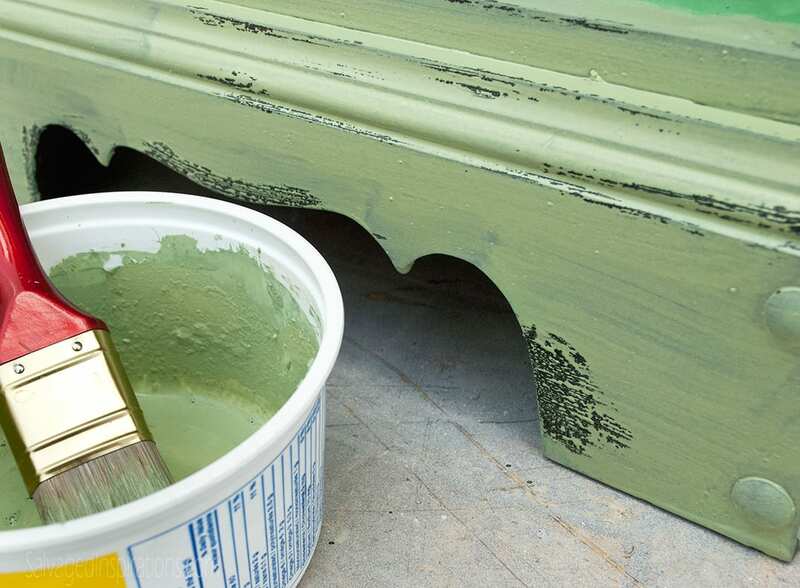 However, when trying to create a distressed or chippy look with more than one paint color, it takes a little patience to sand down just enough to reveal the original 1st coat of paint. Along with patience; a high grit sandpaper and a light hand is required or else you end up sanding through all the layers of paint right down to the original wood surface. This time, rather than using sandpaper or leaving the milk paint do it’s random chipping thing, I thought I’d try distressing with Vaseline to make my chipping and distressing easier to control. Look at this finish! I’m wondering… what the heck took me so long to try this?!!!! Below is the desk after the first coat of milk paint was applied in Miss Mustard Seed’s Typewriter. LOVE this black. It’s a soft muted antique black. Much softer than a lot of blacks on the market and great for any furniture you want to give that old antique look. I look forward to doing another piece entirely in this gorgeous black. Notice how I wasn’t too particular about getting full coverage. I added the paint a little heavier around the areas I wanted to show dark black and left other areas showing a little wood. This gives the piece even more dimension and character. After my base coat was dry, I applied Vaseline only to the areas I wanted chipped and distressed. I used my fingers. Dug in. Grabbed a blob. Applied. No special skills required here guys! Just be aware of WHERE your applying your petroleum jelly. I applied it where the desk would naturally wear more quickly with everyday use. The corners, legs, around the drawer edges and the pulls. For good measure, I added a little to the top, bottom and sides! 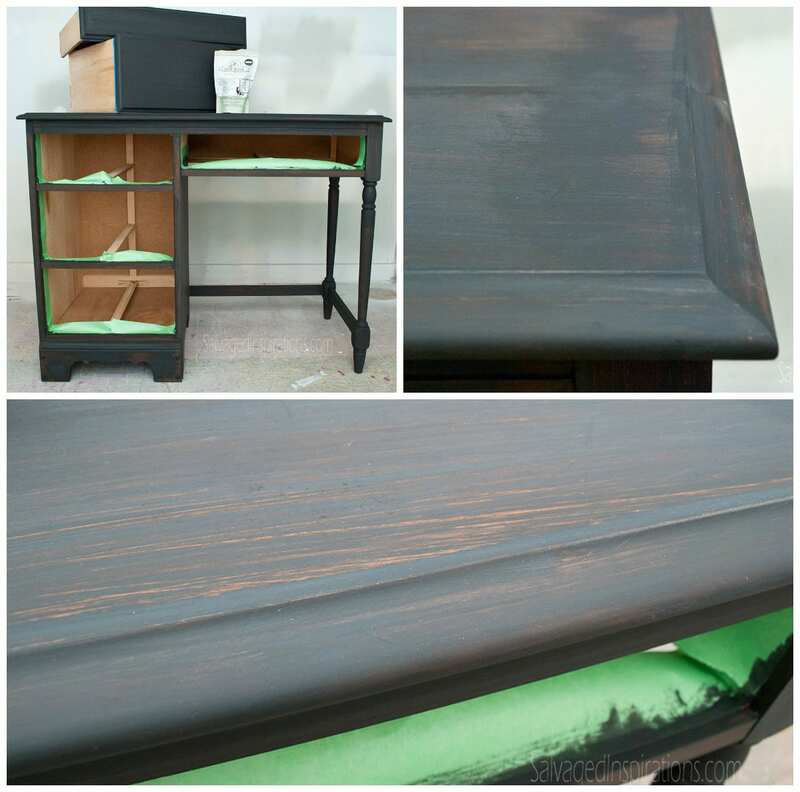 After applying the Vaseline, (which I always have on hand because I love slathering my feet in it and throwing on a pair of fuzzy-wuzzy’s prior to going to bed) I painted the desk in MMS Lucketts Green Milk Paint. I painted normally as if the Vaseline wasn’t even there. The only difference is I used a cheap dollar store brush. A good idea if you don’t want to get any petroleum on your good brushes. You can see the Lucketts Green repels and does not adhere properly when painted on top of the Vaseline. Excellent… this is exactly how it should look! I played around and discovered I can achieve two separate distressed looks when using Vaseline. When I wiped off the paint before it had dried, it gave me a softer distressed look. 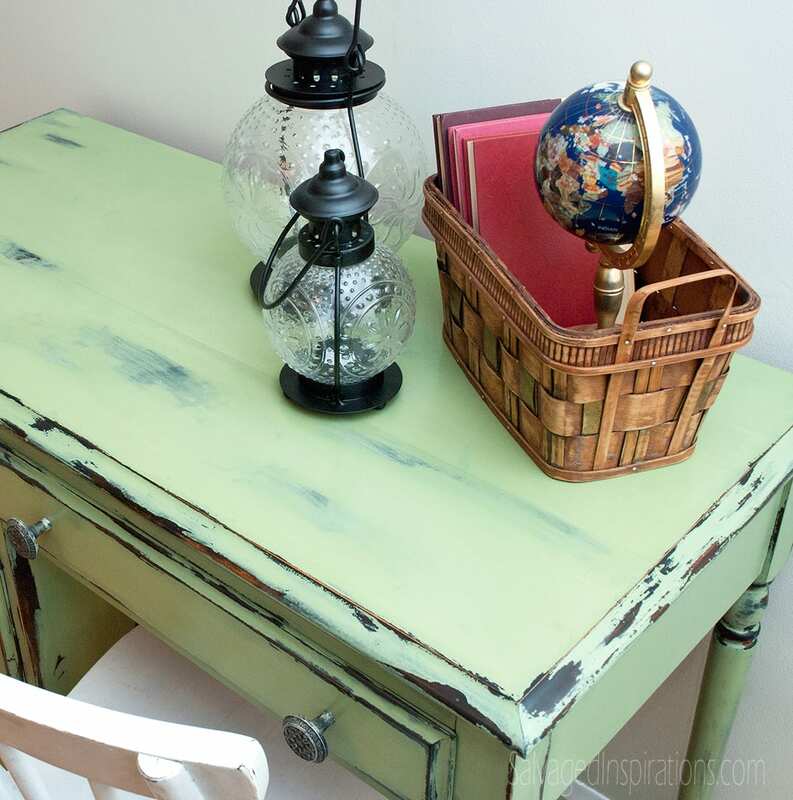 I can compare this distressed look to what you get when you wipe away brand name chalk paint with a damp cloth. A smooth and soft edged distressing. When I waited until the entire piece was 100% dry, I took a shop towel and started wiping away and this created a defined chippy distressed look. Just depends on what your going for. I enjoyed using both on this desk. I’ll definitely be using the Vaseline distressing technique again because it’s VERY EASY. SUPER, SUPER EASY! I can’t wait to use this technique again. This is a great distressing method when you want complete control of the ‘chippy’ when applying milk paint. It can also be used with ANY other type of paint you enjoy painting with! Here are more after’s of the re-styled desk. It’s been waxed in Annie Sloan’s natural wax and the hardware has been re-finished to compliment this piece. 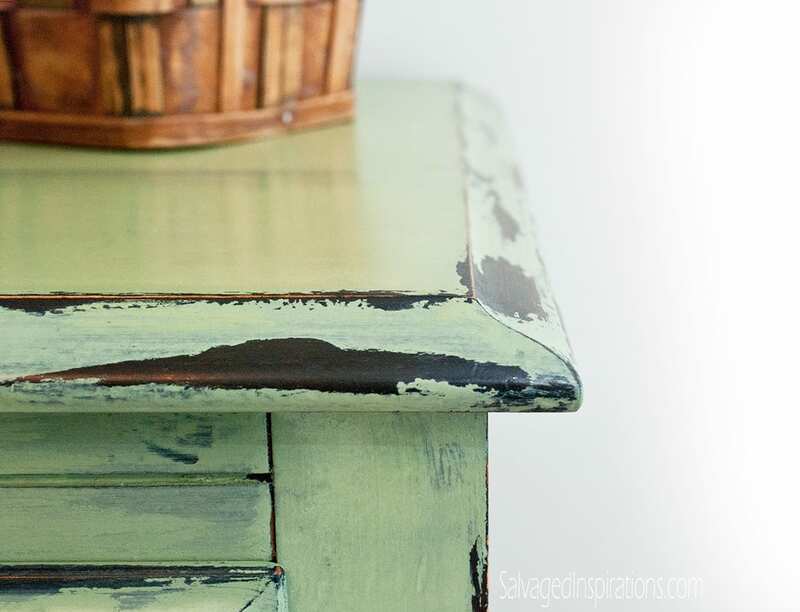 Have you ever distressed your painted furniture using Vaseline? What do you think of this distressing method? I always love to hear your thoughts so feel free to chime in! And don’t forget to join me for tomorrows Quick-Tip-Tuesday… first one of the year! Good to be back – I missed you guys! Like what you see? 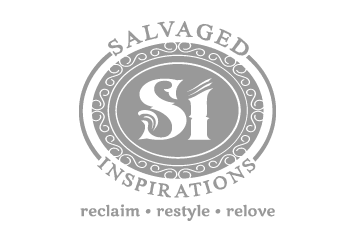 Subscribe to Salvaged Inspirations so you’ll never miss a post! Follow along on Pinterest, Google+, and Facebook for more inspiration! Previous Post: « Happy Holidays to You & Yours! Hey! I love this! Do you sand and prime your pieces before painting with this type of paint? I am re-finishing a -probably Target bought- changing table that has a stain on it. Just the soft cheap wood. What are your initial shoes for projects like these? Thanks! 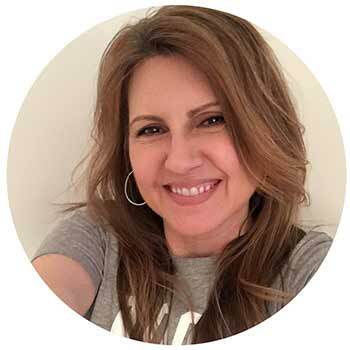 Hi, Denise, I came across your blog while looking for distressing ideas . I am bringing an heirloom Hoosier cabinet back to life,and am very excited to try the vaseline technique prior to putting antique white over deep teal color. I was seriously not looking forward to sanding to get a worn effect. Thanks for the tip. God Bless. thank you Ruth! And have fun with your Hoosier cabinet. Great project! How do you determine how much paint you’ll need for a piece? I have a medium size cedar chest I would like to try this on. Also any tips for a first timer? Hi there Brittany! I used Milk Paint and purchased a bag of each color – then mixed 1 cup at a time to ensure no waste. I still have left over of each color for future projects so 2 bags should be sufficient for a mid sized chest too. 🙂 A guesstimate if you’re using other paint – if it’s a quality paint with half decent coverage and factor in 2 coats, a pint(2 cups) of each color should probably be sufficient for a mid sized chest. Playing is really generous/em> would be a quart (4cups). Hope this helps. Hi Denise, this is my first time for trying that beautiful distressed look. I’m in love with what you did to your desk. Its beautiful!!! I have an old heavy wood dresser that I received painted bright white with bright pink accents on the handles and trim on the drawers. I want to try an antique white with a seafoam blue accent. Would it be better to chalk the entire thing antique white, vaseline the areas, and then go in with my seafoam blue chalk…i’m so new at this i know there needs to be a contrast color under the paint and for the seafoam blue that would be the antique white, but what would be the color under the antique white? goodness, have I messed up already? I’ve finished with the application of the antique white over the entire dresser, and got stuck and found your page…HELP? Absolutely gorgeous! I’m finishing two pub chairs and wish I would have done this! Next time I will! Do you use a finishing wax to seal the project? 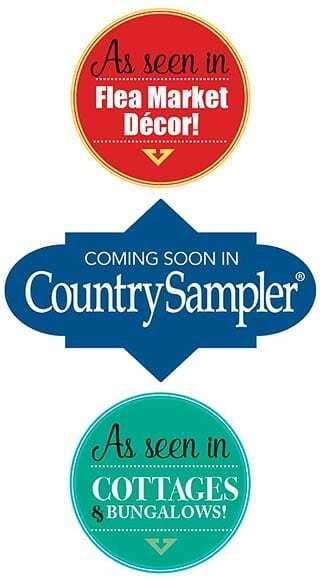 If so which brand do you prefer? Thanks for sharing! Hi! I tried this on a small project but I’m not crazy about the distressing. Is there a way to go back and “redo” where I put the vaseline after I’ve painted? I’m using one color on a wooden frame but I think I overdid my smears of Vaseline!! I haven’t waxed yet, and I’m wondering if I layer on another color might help. Thanks!! I can’t wait to try something with black as the first color, the desk is gorgeous! So funny. I just did my first project also. Really lathered up the piece with Vaseline. Should have done a little more reading! Love it though. So fun to create and work with ones hands!!! Thanks! Wow! Looks beautiful! I am new to distressing…do I need to sand off any existing varnish/paint before beginning?! It really depends on what type of paint you are using Joy. If it’s a chalk/mineral paint – no sanding required unless it’s a very shiny surface. A light sanding for all other paints is a good idea for good adhesion. Hi Brenda I am thinking of distressing my kitchen cabinets. I have maple cabinets, and would like to apply black paint. Do you have any tips or suggestions as to what paint(a country black)would work best? And what sealant? Sanding, Vaseline, paint, wipe off the Vaseline, and then wax. I am an armature at this but would love to make this my summer project. Hi, I have done this to a large coffee table (with six drawers) using two colours – I did use a tack cloth for the first coat prior Vaseline – now I am happy with it and have some non yellowing polyurethane to put on and wonder if it would be better if I use the tack cloth again, what do you think? I also can’t make up my mind wether to first stain the blond wood or not – and the cracks in the table running right across although it is two light colours anyway – maybe not (?) if I do do that – would I still use a tack cloth for better sealing? Thanks for your help! Hi Brenda! I’m thinking “tack cloth” may have a different meaning in Australia than it does here in Canada. Here, a tack cloth is a piece of cheese cloth that has been treated with a tacky/sticky substance. It’s used to remove dust and lint before you apply a new finish. Is this what you are referring too? Do you need a clear top coat when finished? Do you let the Vaseline dry before apply then paint or just go ahead and paint it right over the Vaseline while it’s still wet. Thanks love the look of the desk you did, it looks great!! thank you! Just go ahead and paint right over the Vaseline Sarah… no need to wait. Hey! Question im distressing my nursery firniture. Ive already painted the base coat (duck egg blue) and distressed and chipped where i want. But now im wanting to add a cream color as a top coat so both colors (the dark wood and duck egg blue will show through). Should i just apply a light coat of cream and put vaseline on the dark and where i want the blue to show through? Help first timer lol! Exactly Lisa. Apply the Vaseline to all the areas you DON’T want the cream paint to stick to. Looks great! I’m wanting to do my sofa table. Would it work if I sanded the table then stained it with a dark stain then do the Vaseline then paint with a regular flat paint instead of milk paint? Denise, How would I use this technique on raw wood furniture and did you say use wax on the finished piece or a sealer? 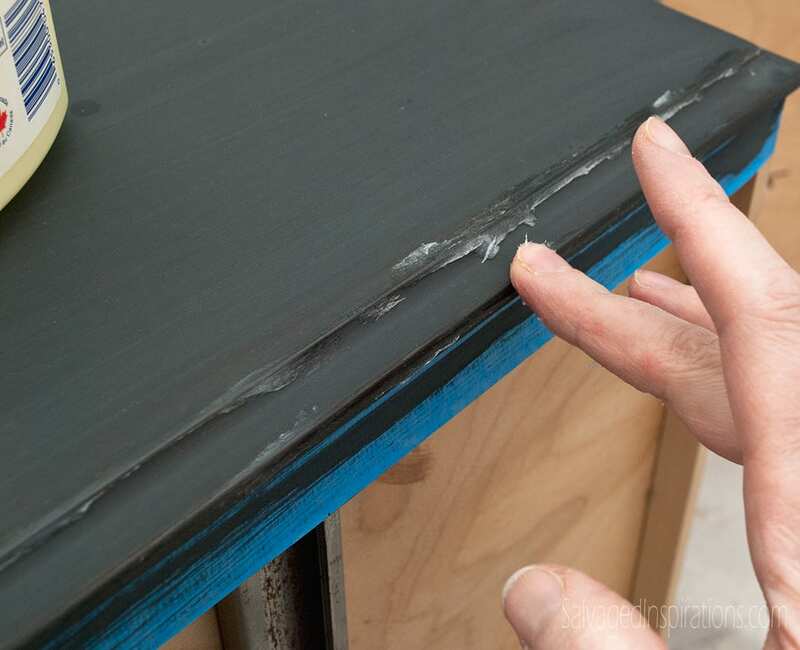 To use this technique on raw wood, the technique is EXACTLY the same as described above BUT NO Bonding Agent is required on your first coat. 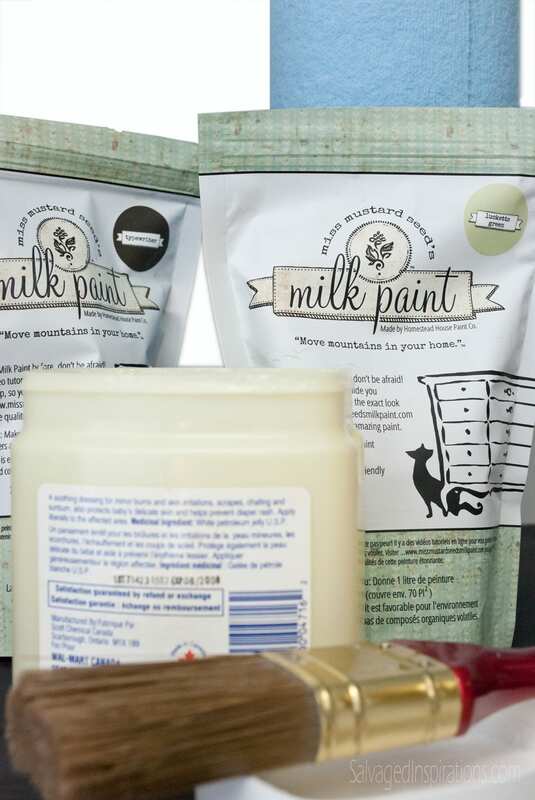 Milk Paint adheres perfectly to raw wood on its own. This piece was waxed Tami. Have fun! Hi! Great tips! I’ve never ever painted nor distressed anything before, but want to give it a shot. I have a black dresser that I want to paint green. So I do not have to sand the piece to start, correct? 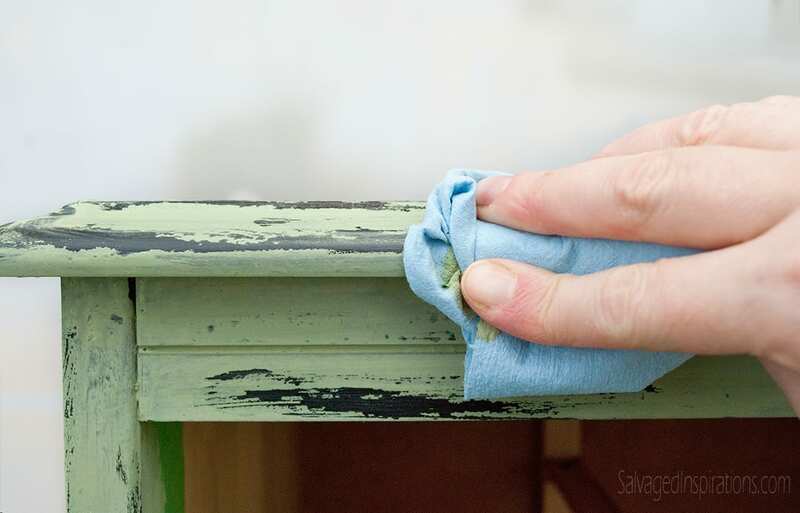 Then I just apply Vaseline to the dresser and add the bonding agentto the green paint, do 2 coats, dry and then wipe away? Then use a poly on top? 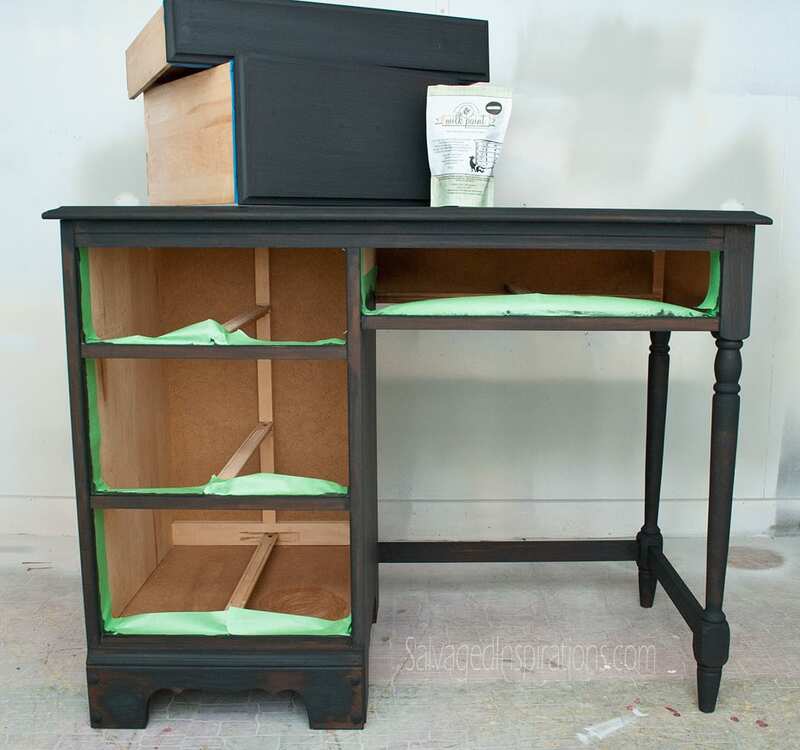 Meredith, if you’re trying to achieve a similar look to this desk and want black to show through, you apply the Vaseline over the black – then paint in green. Using the bonding agent on your first coat will help with adhesion except in the areas the Vaseline has been applied which will repel. You can then chose a topcoat, wax, poly etc. Great question Janelle! Bonding agent is made specifically for milk paint. It’s a milky glue like substance (a concentrated polymer emulsion) that is mixed in with your first coat of milk paint to promote adhesion. 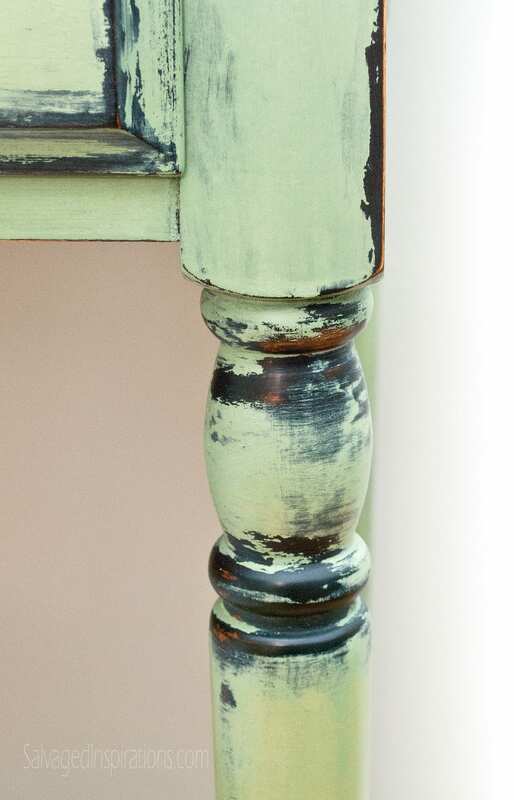 Without a bonding agent, milk paint will often chip and distresses in areas when used on pre-finished surfaces. Another words – it’s like the “primer” of the milk paint world. Hi, thanks for your tutorial. Interesting use of petroleum jelly, I like it. I prefer the more natural, “dirty” distressed look e.g. the subtle and understated, I will keep the jelly idea in my back pocket. Many thanks for sharing this idea. Well I’ve never come across this before – a great idea. I painted an old tallboy dark brown yesterday and was looking up distressing techniques to see what my options were. Found this page so have just done a corner on the back of the piece to see how it turns out . Do you need to apply a clear varnish or something similar once it is all done , if using emulsion paint like I am doing ? Thank you. I’ve been meaning to do something to several pieces that have been ‘residing’ out in the barn. They’re good solid pieces but dated. Thanks so much for your well-written and easy to understand post. Now… I’ve got to get to work!! I am in love with your blog. Already started my first DIY project ever based off this dresser. Your instructions were clear and concise. For once, DIY’ing wasn’t an overwhelming failure for me. Hi! Can’t wait to try this technique out on a desk I just purchased. 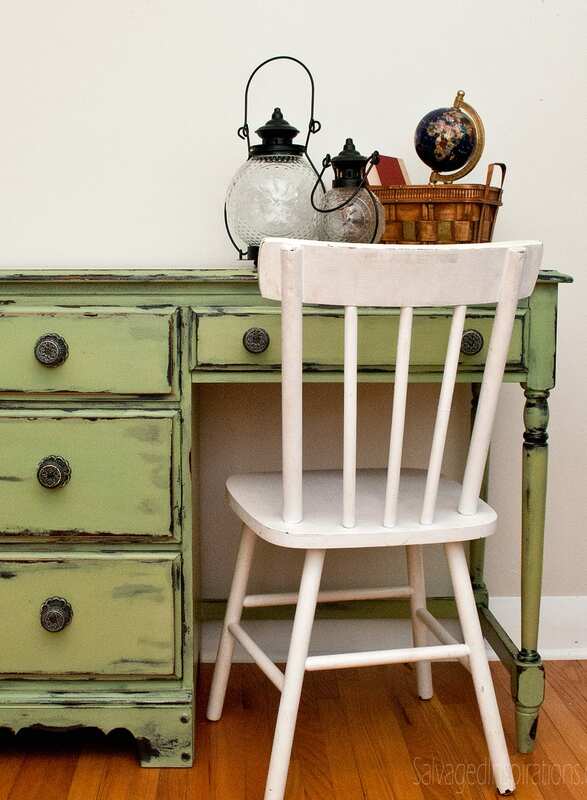 I want to use the ‘linen’ milk paint but am unsure if i need a second paint or could just use the dark wood of the desk as the background color (you used typewriter) when i make the distressed look. For this project, I wasn’t fond of the blonde wood stain on this desk so I used the MMS Typewriter for a nice dark contrast under the green. However, it’s a beautiful dark wood that you’d be happy with showing through in areas… no second paint required Marissa! Looks beautiful! Question though. .. I’m in the midst of a project and just realized i am out of vaseline (ugh), what else do you think could give the same effect? Vegetable oil, wd40? I’m stuck! Denise, I’m confused about when you start wiping off the Vaseline. Do you let the two coats , after the primary color dry’s and Vaseline is applied , dry between coats and then wipe it off and distress it ? Also is the Bonder you use , mixed into the first primary coat , applied after it dries and then add the Vaseline ? thanks, your work is beautiful !!!!! I used the Bonder on my base coat (black) but it is not needed on any additional coats regardless of color Susan. Once base coat is fully dry, apply the Vaseline where you would like to see the distressing. Paint over the petroleum jelly with one or two coats as required. Once totally dry, wipe away the Vaseline and this will give you the chipped off look. If you want a softer/muted edge, you can wipe the vaseline off before your topcoat has fully dried… just depends on the look your after. I love this!! My question is, If the piece requires multiple coats of the top coat for coverage, do you wipe off the vaseline areas between coats or wait for all of it to dry? When you say 1 package of each I assume you mean the quart size package? Hi Vickie! Yes, as far as I know, MMS Milk Paint only comes in the one size – 230g which makes about 1 quart. The wax adhered perfectly Kellie! I’m going to be redoing an outside table, can I use a hardware store brand paint and put a polyureithane coat over it to protect it from the elements? So you didn’t need to sand the piece initially? I have an old dresser and crib that I’m contemplating trying this technique on. The poly was pretty thick on the dresser, which I’ve already spent a day sanding. If I can achieve this look without sanding the crib too, that’d be great to hear! Can i use chalk pain instead of milk paint? And can i use minwax instead of vasaline? 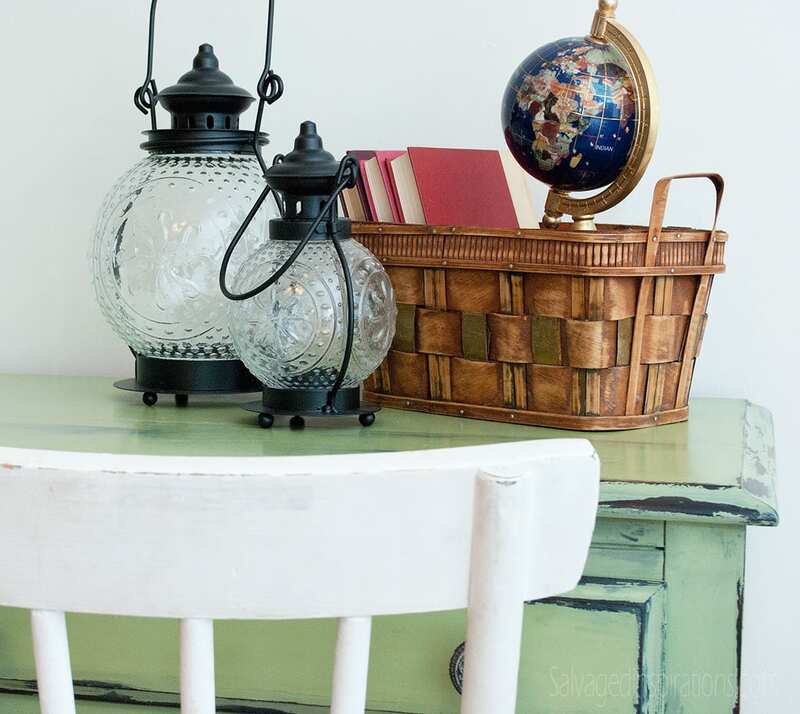 Yes, you can definitely use Vaseline to distress with chalk paint(s). However, the Minwax should be reserved for the top coat. 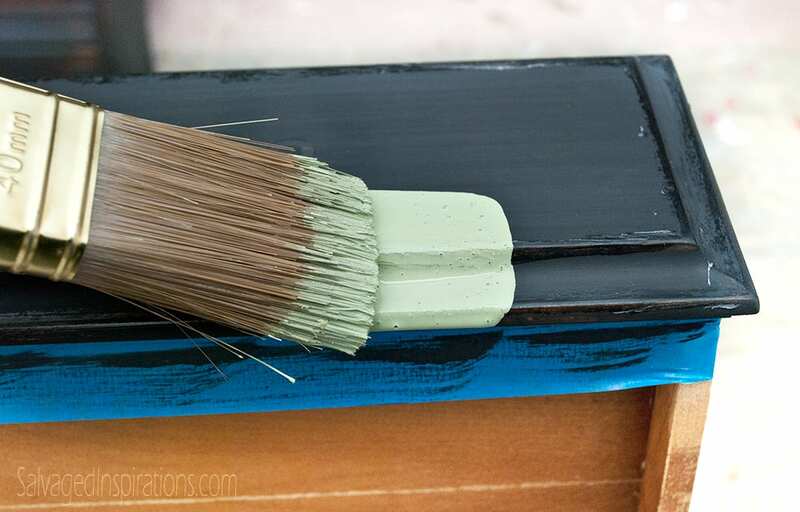 Chalk paint(s) can be used over top wax so it will not help you distress. It’s beautiful! I may have missed it but did you add bonder to the luckets green or just mixed it without? Julie, I added Miss Mustard Seed’s Milk Paint Bonding Agent to the very first coat(Typewriter Black). Then all additional coats after that, no need. 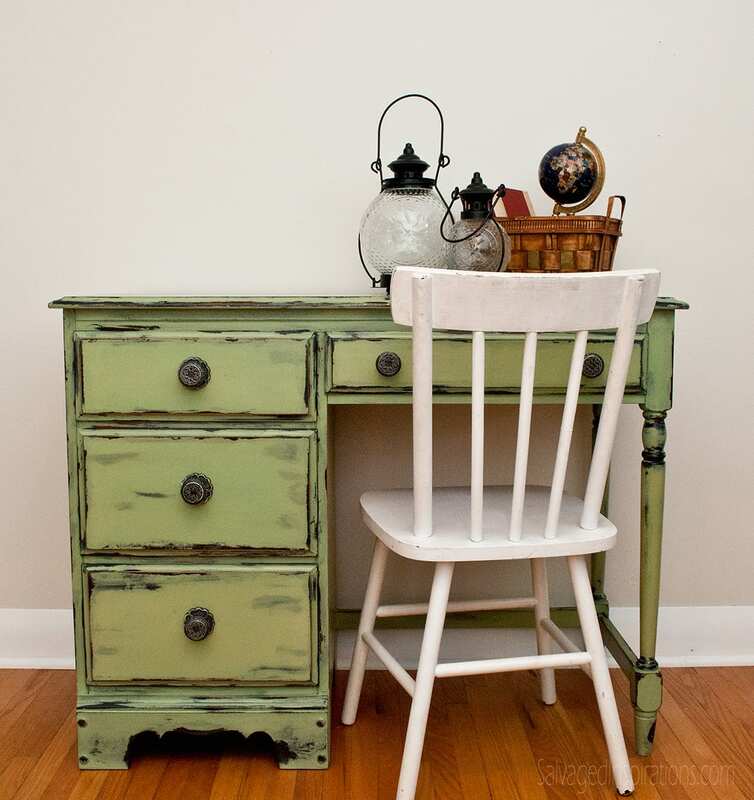 what bondig did you use with the milk paint? sorry i meant to ask if i coiuld make my own milk paint too and in such case what bonder would i use? I’ve never attempted to make a DIY Milk-Paint (may try one day though!) but if I did, I would use the exact same bonding agent I do now (Miss Mustard Seed’s… or I’m sure any brand would work). Josef, I added Miss Mustard Seed’s Milk Paint Bonding Agent to the very first coat of milk paint. Additional coats don’t require any bonding agent. Denise, this turned out GREAT! Wow, what a great idea for a dresser I am thinking of painting. Thank you!! I have never used the Vaseline method but have used the candle wax method. It does a good job of repelling the paint and does not require a throw away brush. However, you do need to sand or use a plastic scrapper to remove the top layer of paint. I will try the Vaseline method and report back. I have 100% all natural bee’s wax blocks that would probably work perfectly for the distressing method you’ve described Jeri. In the near future I’ll give it a try and report back also. 🙂 And yes, I’d love to hear what you prefer better if you decide to try the Petroleum distressing! This is a great technique!!! Thank you for the tips and your tutorial. Love the results on the desk, looks great! Looks great Denise – thanks for sharing! So when you dragged your brush over the petroleum gel it didn’t then transfer to the next place you painted? I’ve stayed away from this because of that fear of unintended transfer. I was worried about that too but surprisingly no! I used a really cheap dollar store brush with slightly stiffer bristles which may or may not have helped. Also, the milk paint has a more ‘watery’ texture anyway and I just made sure not to overwork it while applying. I’ll be curious to see how this petroleum method works with chalk/mineral paint or enamel. Would the Vaseline method work with spray paint? For sure! Whether the paint is brushed or sprayed, the Vaseline will still repel it. Loved what the Vaseline did, but what is recommended for keeping it all in tact. I used a clear polyurethane on my last project and it yellows the table !! Use Polycrylic to seal with. It seals like polyurethane without the yellowing if you are looking for the durability. Is the polycrylic more lasting than the wax? Yes Diane. Wax usually requires reapplication down the road. Thanks Denise, now do I mix the paint with water and add the bonding agent PR do I use the bonding agent in place of the water? HI THERE, WELCOME TO MY BLOG! SO YOU DON'T MISS A THING! Enter your e-mail so you don't miss a thing! I LOVE sharing... that's why I blog! I'm humbled and flattered when you share my work, so SHARE AWAY! Please feel free to use ONE (1) photo per post with a credit link back to the original post. Additional photos or text may be available with my written permission. 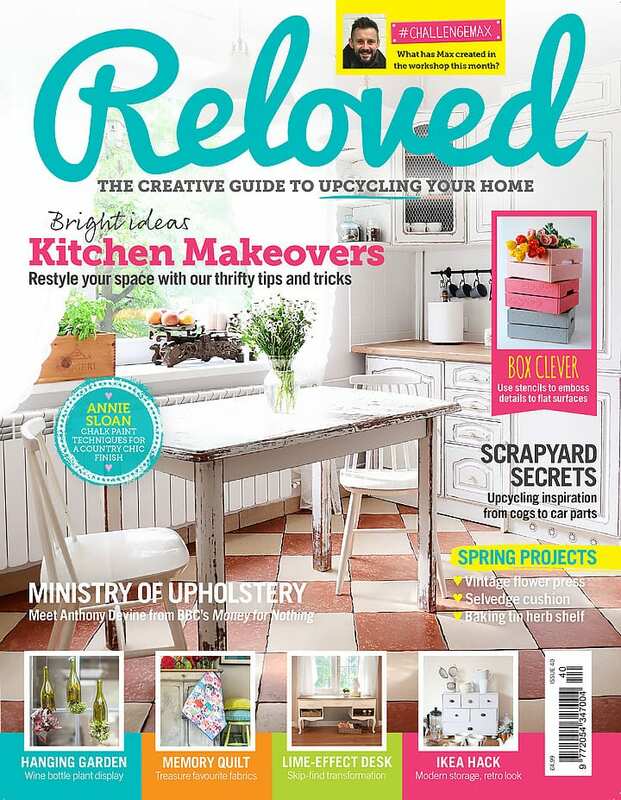 All images, tutorials and work are copyrighted to Salvaged Inspirations 2012-2019 ©Salvaged Inspirations.